To celebrate INTERNATIONAL WOMEN’S DAY, there will be a FREE LUNCHTIME LECTURE at the VICTORIA AND ALBERT MUSEUM, LONDON on WEDNESDAY 7 MARCH at 1pm . Seating is unreserved in the Hochhauser Auditorium. 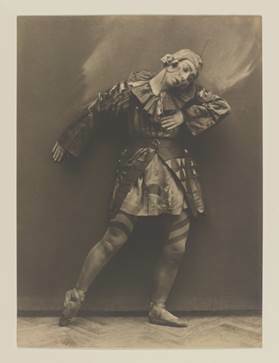 Jane Pritchard, the V&A’s curator of dance, will be discussing the career of the dancer choreographer and teacher Bronislava Nijinska focusing on her work seen in Britain and celebrating the V&A’s recent acquisition of a major collection of costumes designed by Alexandra Exter for Nijinska’s 1925 company, Théâtre Choréographique Nijinska. Bronislava Nijinska (January 8, 1891 [O.S. December 27, 1890] — February 21, 1972) was born in Minsk to a family of dancers of Polish descent. She was the younger sister of the renowned dancer Vaslav Nijinsky whose muse she became as he created his controversial ballets for Serge Diaghilev’s Ballets Russes. Under his influence she investigated radical ways of movement and became in her own right one of the most significant choreographers of the twentieth century. Her most famous creations include Les Noces (1923) and Les Biches(1924) for the Ballets Russes, and Bolero and La Valse for Ida Rubinstein’s Company (1928-29). In addition to the collection of costumes for Théâtre Choréographique Nijinska, including those for Jazz currently on display in Rhythm & Reaction The Age of Jazz in Britain at Two Temple Place, London, the collection at the V&A includes costumes designed by Natalia Goncharova, Marie Laurencin and the remarkable costume (shown above) designed by Léon Bakst for Nijinsky c.1906 and re-purposed during the Russian Revolution for Nijinska’s avant garde recitals in Kiev which is now on display in the Theatre & Performance Galleries at the V&A. A Chance to get Professional Help with that Lovely Costume!